The Leyland cypress, often referred to as “Leylandii” after its botanical name cupressocyparis leylandii is one of the most beloved hedging plants in Britain. One of the most important reasons why this evergreen hedging conifer is so popular is its unusually rapid growth rate. Leyland cypresses can grow up to 90 centimetres per year and will therefore make a high, dense screening hedge in less than three years. It is worth noting that Leylandii hedges have a relatively open growth habit directly after planting, but they will grow denser after a while. Therefore, if privacy is what you are after, a Leyland cypress hedge is a cost-conscious choice that will give you exactly what you want in a relatively short amount of time. 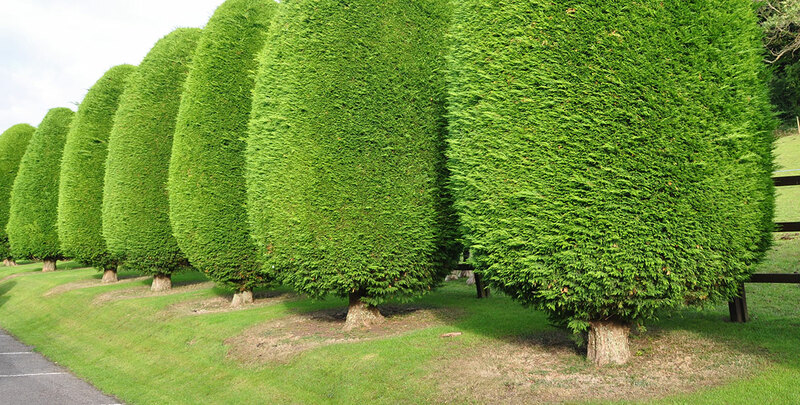 While its fast growth rate allows a Leyland cypress hedge to reach its desired height relatively quickly, it also means that it needs to be pruned frequently in order to keep it in check. If you wish to keep your Leylandii hedge neatly trimmed, pruning it at least twice a year is a necessity. This type of maintenance is best done during the summer. Leyland cypresses can reach an ultimate height of no less than 15 metres, but please note that overgrown Leylandii hedges cannot be cut back, as the species does not tolerate pruning into old wood. The Leyland cypress demands a lot of sunlight, so we strongly advise against planting this type of hedge in the full shade, though it does tolerate partial shade. It is not very demanding regarding soil types, however, as it will be able to thrive in virtually any well-drained soil.